The Regional General Assembly is the supreme organ of the Section. It has responsibility for the overall policy, direction and oversight of the Section. The Regional General Assembly comprises all members of UCLG in the region, through their duty appointed representatives. The Regional Council is the principal policy-making body of the Section. It decides the Section’s policies in a collegial way and ensures that general policies decided by the Regional General Assembly are implemented. The Executive Bureau is responsible for initiating proposals and carrying out the decisions of the Regional Council and for any other matter delegated to it by the Regional Council. It is in charge of the Section’s administrative and financial management. It prepares the meetings of the Regional Council and of the Regional General Assembly. The Presidency, comprising the President and six Co-Presidents, is elected by the Regional Council from among local government members representing the different sub-regions, for a renewable term between two ordinary sessions of the Regional General Assembly. 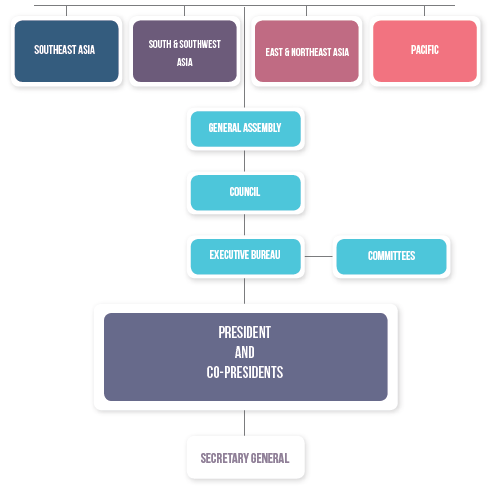 The Presidency represents the four sub-regions as well as associate and international members and includes the Co-President (from the host city of the Secretariat) and the Founding President. The Secretary General is the chief executive officer of the Section. He/she directs the daily activities of the Section and carries out the decisions of the Regional General Assembly, the Regional Council and the Executive Bureau. The Secretary General manages the General Secretariat and the activities, programmes and finances of the Section under the guidance of the Presidency and reporting to the Executive Bureau.